Crawl face down in mud. Slog knee-deep in frigid water. Leap through walls of fire. Hurl teammates up and over tall barricades. Extreme obstacle courses offer thrill-seekers a new kind of fast-paced fitness adventure that goes far beyond older events like marathons and triathlons. With step-by-step instructions and extensive course summaries, the training program in this book gives readers the ability to develop the full-body physical strength and fearless mental endurance needed to conquer every obstacle on any course. Modeled on Special Forces training blueprints, obstacle course events have attracted millions of participants over the past ten years. Their popularity continues to surge: in 2012, over 100 events are scheduled across the United States, Canada, and Britain, ranging from kid-friendly short sprints to the extreme 48-hour Spartan Death Race. In this one-of-a-kind book, the authors, veteran obstacle course racers, show readers how to gain the fitness, dexterity, and confidence needed for course challenges such as mud slopes, climbing ropes, and log hauls. 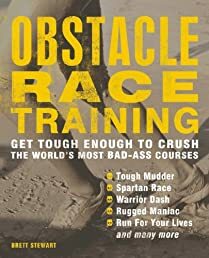 Covering all the major obstacles and providing tips about race-specific events like Tough Mudder’s Electroshock Therapy” and the Muddy Buddy bicycle sprints, this book is a must for anyone looking for instruction and inspiration to release their inner champion. 7 Weeks to 300 Sit-Ups: Strengthen and Sculpt Your Abs, Back, Core and Obliques by Training to Do 300 ..